Baltimore-based composer Alexandra Gardner joins the SOB this March as part of our second annual String Theories Festival for the world premiere of a new commissioned work for string orchestra. Praised as “highly lyrical and provocative of thought” (San Francisco Classical Voice), “mesmerizing” (The New York Times), and “pungently attractive” (The Washington Post), the music of composer Alexandra Gardner draws inspiration from sources such as mythology, contemporary poetry, and her training as a percussionist. Composing for varied instrumentations and often mixing acoustic instruments with electronics, Alexandra is building new audiences for contemporary music through an expressive sound and flair for the imaginative and unexpected. Also joining us again is loadbang, for the world premiere of our co-commissioned work from composer Taylor Brook. 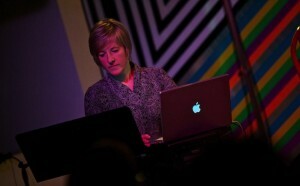 Brook writes concert music, music for video, and music for theater and dance. His work has been performed around the world and has been described as “gripping” and “engrossing” by The New York Times.